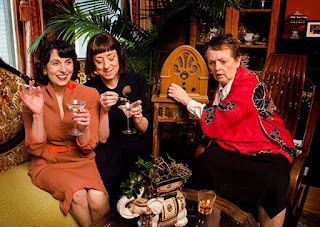 Gertrude Stein (Candace Barrett-Birk) and Alice B. Toklas (Sue Scott) invite Agatha Christie (Alison Edwards) to a dinner party. Agatha invites her friends Dorothy Parker (Elizabeth Desotelle) and Lillian Hellman (Vanessa Gamble). Gertrude and Lillian can’t stand each other. But that’s not the thorniest problem with the dinner arrangements. Gertrude and Alice are living in the French Alps in June 1940, and Hitler’s soldiers are invading France. France hasn’t surrendered - yet. Gertrude and Alice’s friend Muriel Gardiner (Laura B. Adams), who has unexpectedly arrived a day early, is an operative with the resistance, smuggling passports to Jews so they can get out of Europe before it’s too late. Gertrude and Alice’s housemaid Bernadette (Miriam Schwartz) is German, and a Jew. In fact, nearly everyone at the dinner party is Jewish, not to mention that Gertrude and Alice are longtime lesbian companions. What could possibly go wrong? That’s the premise of Little Wars - a hilarious yet deadly serious play from Steven Carl McCasland. Did this dinner party really happen? Probably not, but the premise fits so tidily in the cracks of history that it’s a tantalizing “what if?” Though McCasland is a very 21st century playwright, Little Wars is fashioned as a very old-school sort of play. Basically it’s a great excuse to get these towering female figures (and the wonderful actresses who play them) all in the same room together to lob insults and witticisms at one another. But that’s not the only thing that’s going on here. It’s easy to see why new theater company Prime Productions chose Little Wars as their inaugural production. Their mission is to “explore, illuminate, and support women over fifty and their stories through the creative voice of performance.” These women “of a certain age,” women in their prime, dominate the story and the stage in Little Wars. Only women with this much brass, and experience, can push back against the darkness encroaching on Europe - if they can stop warring with each other for a minute first, that is. Little Wars explores that notion from many angles - what are human beings, women, artists, expected to do in the face of evil? If they can’t save everyone, what’s the point in saving anyone? Is there such a thing as too late in a situation like this? When you have a powerful voice at your disposal, how do you speak out or fight back, especially when speaking out or fighting back could get you killed? That might make Little Wars sound pretty bleak, but rest assured, McCasland’s script is reminiscent of plays like Claire Boothe Luce’s The Women, or take your pick of any Noel Coward title. One joke barely lands before the next one arrives on its heels. And yet these women are all so smart and self-assured that when they turn to weightier topics, it also makes complete sense. Director Shelli Place and her fine ensemble keep the story moving fluidly back and forth between comedy and drama without skipping a beat. It’s great fun to watch.